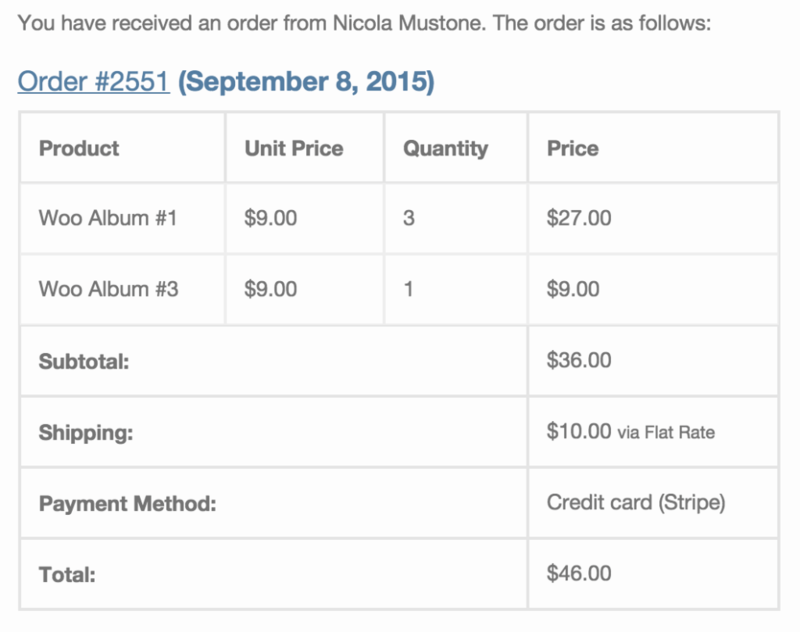 Some months ago I wrote a post about how to add the unit price in the checkout page. It would be useful though to have the same unit price also in the emails sent both to the admin and to the customer. Doing this it’s harder than what we did for the checkout page. There are more templates to tweak and we also have to consider both plain and HTML emails. But it’s not impossible, obviously. Download the zip above, then extract it. You will have a folder names emails in your computer. Copy that folder and put it in wp-content/themes/your-theme-name/woocommerce/. Note: If you are using a custom theme which already overrides the emails templates be careful. This may break your theme. Contact the theme author before to override the templates. Hi Crystal, what email is that exactly? I may have missed to add some code in the zip, sorry. After that worked and was in the correct order. Thank you for your help, this should really be part of Woocommerce as a default function. It just makes sense. Dear Nicola, excellent post thank you. Is there a way to transform this into an invoice by adding the sequential number of invoice too? Sorry for the very late reply! Technically yes, it is possible. You need to add the code to print the number. I’m not sure what to add because it depends on the Invoicing plugin you are using. Hi Nicola, it’s not working for me unfortunately. I’ve put the file in the child-theme/woocommerce folder and then in the maintheme/woocommerce folder – both extracted of course! Not sure what I’m doing wrong unless this fix if pre Woocommerve 2.5? I just tested this on WooCommerce 2.6.1 and it works. I guess it works also for the 2.5 since the templates are the same! Make sure that you are pasting the whole emails folder in child-theme/woocommerce/, and not only the files inside the folder. its great …Thanks for this . i have the same issue as Crystal . the columns are switched. quantity has the prices and the Price column has the quantities..
it will great if get the fix . Can you please try to disable the theme/plugins? For Crystal it was a conflict with another plugin. It is still working properly for me. Does this work with WooCommerce 3.6.6? I am nervous about replacing the “whole folder” since your folder has about half the .php files as the current version. Thanks for reporting. I’ll have to update the templates, but the difference is very small. I simply add a new row in the table. You can open the files from my zip, copy the differences and add them to your templates from the 2.6.6. I’ll update the zip in this article as soon as I can. Thank you so very much for sharing. It works very nicely. However, if an order is fails, I need also the customized order table. Do you have a updated file for this condition that you could share? In addition to that, is there an easy way to add a block of text at the top to include the seller company contact information and to move the customer details above the order items table? Can someone tell me how I can translate the title Unit Price after insert the file? You can do it with Loco Translate or just write it in the language that you want to use directly in the code. With WooCommerce v3.0, two templates were modified: email-order-items.php one located in the emails folder the other in the plain folder. Are you planning to update your templates to WC version 3.0? That would be very nice. Yes Lyse, I’ll update them! Please let me know when they are ready for download. Thank you for responding quickly. I have to upgrade to WooCommce v3.0 now, so I looked at updating the two templates myself but one of them is giving grief because the new version appears to be stripping tags which your template has and I’m not knowledgeable enough to understand the implications and risk I would be taking guessing what these will do or counter react. Any ETA as to when you would have the time to look at these two templates only? The more difficult one for me is the the file in the plain folder. Thank you so much for updating the templates so quickly. All works very well. Hello I’m using custom plugin for email templates (Email costomizer) how can I add price per unit in my email template? I’m sorry but I don’t know that plugin, you should ask to the author. I had a look at updating these myself but I’m a little confused with the new changes. Any ETA as to when you would have the time to look at these templates? Do you have an ETA on when you may be able to provide updated templates? I’ve updated the files now! Is there a way to not add discount to the unit price? When I have a discount it shows discount applied instead of just unit price. Replace that get_item_total with get_item_subtotal. Thank you so much for this, I have been trying to solve this issue for a client for a few weeks now with no joy. This worked fantastic, I had to make a small adjustment as the subtotals, tax etc where showing in col 2 which looked untidy so simply changed this to col 3 to achieve. One question: How to show if variable product – SKU of product instead of SKU of variation? You can change the SKU that is shown in the template email-order-items.php. Thank you so much. Working on WP 4.9. There is now a revised 3.4.0 version of the email-order-items.php and yours is still at version 3.2.0 after I download it. Do you have an update of your files available download? The plain emails version is still 3.2.0 as per WooCommerce core. Oh man you just saved my day! I was looking for something like this for about 2 days straight. Downloaded the files and uploaded them to the right folder and it works right away. Only thing i had to change was the column thing, but that was easy enough..
BTW since today (nov, 1st) the template is out of date since there’s a 3.5.0 core version, I didn’t test if it’s still working, but i thought i let you know! Print the price per item only in the letter for the store. What file to use? Thanksssssssssssssssssssssss so much 🙂 I’ve been looking for it for a long time. I just noticed in the last month that some product images display in the emails and sometimes they don’t. I’ve talked to a WooCommerce support representative about this and because I use customization, they can’t provide support on this issue. echo wc_get_email_order_items( $order, array( // WPCS: XSS ok.
Can you help with my issue of the product images not displaying in emails? Hello from me. I tried to use your files try to print Unit price in order emails. In the middle of the table where was written the products, the info for price appear, but in header of the table and in footer with totals – no changes! Where must be the problem?